Mirka Part Number: 8992450111 MIRKA¨ ROS 150 NV (Non Vacuum) 32 mm finessing machine is light, the weight is under 0.5 kg and has a maximum speed of 8,000 rpm. 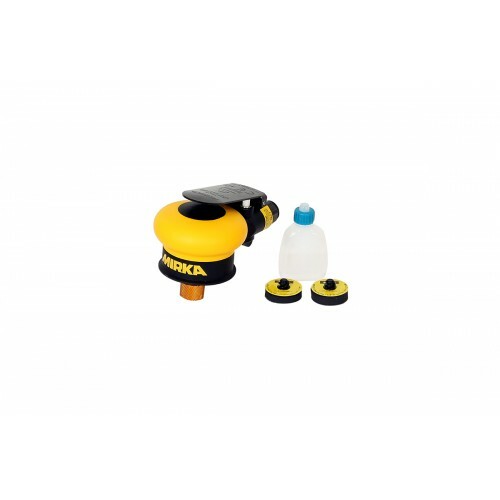 MIRKA¨ ROS 150 NV has a 5.0 mm orbit, the lever is colour marked for different orbits. 5.0 has a black lever. MIRKA¨ ROS 150 NV has a quick lock attachment on the backing pad and is fast and stable to use. MIRKA¨ ROS 150 NV makes a lower scratch pattern to the surface, which makes this tool perfect for sanding smaller surface areas. This is supplied in a cardboard box. Please allow 3 - 5 working days for delivery.